beams Gerron during a recent telephone interview. “I just decided to leave teaching for a little bit in order to compete on the show. I’m so, so excited to have this opportunity. 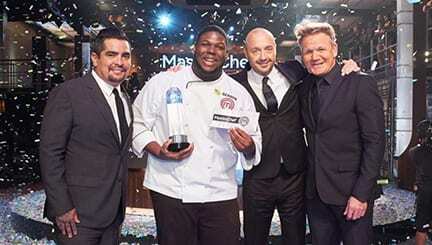 To be able to cook for these prolific judges during the finale, gave me a chance to show everything that my mom and grandmother taught me about cooking,” says the home chef winner who’s originally from Louisville, KY.
Not only did Gerron cook his way into a cool quarter of a million dollars, but he’s also one of chefs who will be participating in Camp MasterChef 2019. This is an immersive culinary experience designed for kids and teens ages 8-16. It’s an unforgettable week full of cooking, learning, team challenges and fun. Week after week Gerron met the challenge of cooking several different entrees during the show’s intense competition but it was the ‘Seafood Challenge’ that he personally found to be the toughest. “The Seafood Challenge. Man, I tell you, fileting that halibut was tough for me. It was shrimp, crawfish, various types of other fish, it was just so many things that could be done with those kinds of ingredients. It was hard to zero in on one particular idea for a dish…I’m really a southern comfort cooking type of guy. But during the competition, I learned so much about how to cook desserts…MasterChef helped me to get more experienced on baking pies, cakes and cupcakes. I really learned to perfect my baking skills more. But any dishes that has to do with southern comfort cooking, I’m all in,” reveals Gerron. The new MasterChef winner is now having to adjust to being recognized by fans. He shares that he can no longer casually run to the store looking scruffy because fans recognize him and want autographs or pictures. But the main question on everyone’s mind is: What will Gerron do with all of that prize money? He says: “I would like to open up a culinary program at the high school where I teach. There’s wedding plans (engaged to Brandi Beckham). Maybe get a food truck; do some pop-ups in different places; do some type of cookbook focused on southern comfort foods; do some traveling and eventually start a restaurant in either Nashville or Louisville.” Congratulations Gerron on the big win and your upcoming nuptials.